Pigs are a big thing all over PNG, but their importance seems to escalate the higher into the mountains you go. You find pigs everywhere, except for in Seventh-Day Adventist areas. The SDA’s don’t eat pork, and so when you see goats in a PNG village, it’s a pretty safe bet that there is an SDA church nearby. As I mentioned in an earlier post, pigs are not just a source of meat. In fact, they are usually only killed for special occasions. They are often used to pay bride price (the gifts that the groom’s family will give to the bride’s family when a marriage takes place) or to settle compensation claims (another post is coming explaining compensation). When we were on the coast during training, Brian used to jokingly call me his “10-pig wife,” because on the coast, 10 pigs is what a good, hard-working wife might cost you. However, in the Highlands, a 10-pig wife isn’t much of a wife at all. A good wife will cost you a lot more pigs than that! In the Imbo-Ungu district, we saw some of the best cared for and most expensive pigs yet. We had seen other villages where the pigs just run around loose through the village, but the Imbo-Ungu keep theirs in specially fenced pastures that are far away from living areas and water supplies. We often saw men leading their pigs to and from the pastures. 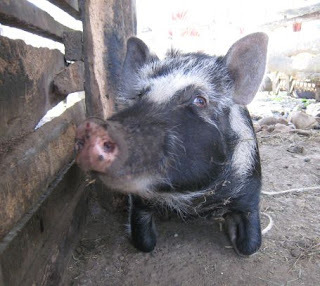 They build special pig houses for them, and when it gets cold, they even build fires to keep them warm. They are also very particular about what they feed them. They will only feed them select kitchen scraps, and they also boil sweet potatoes for them. We were pretty impressed by the way the Imbo-Ungu take care of their pigs. We learned that a full-grown pig will fetch a price of up to 1500 kina (about $570), which is quite a bit of money. The Imbo-Ungu insist that their pigs are the best in the country, but they usually only sell to each other. I guess people from other areas can get cheaper pigs from their own wantoks. 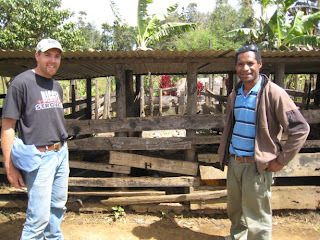 Below is a pig barn that our friend Mathew showed us in his village, with individual stalls built to hold six pigs. Just think Brian, we used to have 700 pigs, we would be wealthy there.